Walk the streets of Williamsburg, Virgina and experience life during the American Revolution through the eyes of a young girl and her apprentice friend, Ben. Better understand the cost of our freedoms today while studying this foundational time in our history. Felicity® - A six week unit study using the American Girl® Felicity® series books. The American Revolution is a rich and vital time in our history. This study gives children a look into life during this time. Suggestions to further the study of this time period as well as craft and field trip ideas are included in the unit to help enhance the study. All units now include spelling and vocabulary, State/Country study, Character analysis worksheets, then and now comparison worksheet, news article prep, book summary, chapter summary with drawing, and digging deeper project suggestions. This product is sent via email as a PDF file. This time in history is filled with so much information you could easily spend months on it. Choose what works for you, the ages of your students. Some things to consider including during this unit study are The French and Indian War (this is not a war between the French and Indians), causes leading up to the American Revolution, George Washington, Paul Revere, Ben Franklin, Betsy Ross, Continental Congress, women of the war, etc. Craft and field trip ideas from the time period are included in the unit to help enhance the study. Some examples of crafts include; cross stitch, clay marbles, drawings and more. Making history engaging for students is possibly one of the most difficult tasks for teachers. How do we overcome that? Two key things are critical for accomplishing this task. First, it must be relatable in someway, and secondly, it needs to offer learning opportunities for multiple learning styles. Girls of American History uses the popular American Girl book series. This instantly makes history relatable, as the main characters are school age children, families and strong male characters. 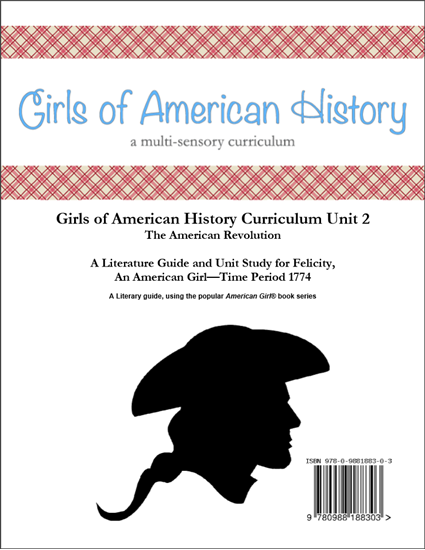 Girls of American History uses multisensory learning, which follows a pattern of Do It, Write It, Say It, Read It, See It. Multisensory learning is great for every kind of learner - because each learner gets to experience learning the way they are most comfortable - but they also have the opportunity to learn through other senses. Studies and research have shown that learning material through multiple senses helps children to retain information better. The experiences practiced in multisensory learning allow each student to participate in ways that help them understand and retain best. Boys and girls learn together and help each other with projects such as making clay marbles, playing time period games, having discussions about the story, historical information, as well as positive character traits such as loyalty, bravery, etc. Schooling multiple ages together, in a co-op setting for example, is very manageable. And, with the continuity of the same subject matter for literature and history, as well as crafts and field trip experiences, opportunities for discussion are plentiful and help build a love of learning. This six week unit study using the American Girl® Felicity® series books is also great for doing school in a large class setting, or a smaller co-op environment. At the end of the unit have a freedom party of your own! There are two options for the required readers for this unit. American Girl orignally printed the Felicity® stories in a six book set. These stories have been reformatted into a three book set called "Beforever". Either book set will work for this curriculum. This series of books takes place during the time leading up to the American Revolution. The young lady in this series learns about conflict and resolution, forgiveness, as well as her own struggles and victories. Strong male characters include her father, grandfather and a young apprentice. All of the male characters are present throughout the series. **Crafts are not included in the purchase of the curriculum, but resources and instruction as to what crafts to purchase are included. Teacher License allows permission for the purchaser to teach to as many groups and classes as they like. There is no expiration. Teacher may not make copies for parents, other teachers or the school/co-op. The file remains the property of the purchaser only.